The Rambler, Tim Rutherford-Johnson, has investigated a recent Proms score by Mark-Anthony Turnage, discovering that it is, in part, an amped-up transcription of a recent pop hit (here and, most astonishly, here). Between this and the 800% slowed down Justin Bieber tune, noted on this page a few days ago, one starts to wonder if we are moving into a new era in which art music parodies of popular material become a central genre. While I'm certain that there are some intellectual property thickets to cross through here, if this phenomenon establishes itself, it would seems to be placing the relationship between commercial and art music production back onto a more comfortable plain, and a plain long familiar to composers. Just think of all those masses built around the Renaissance pop song L'Homme Armé, many of them stretching the melody or hiding it in a dense texture beyond immediate recognition, or the complexes of remembered tunes and landscape in Ives (and, to some extent, Mahler). I've long subscribed to the notion that composers compose out of their acoustical environments, and such popular musical material is often — and unavoidably — as much a part of the environment as the bird songs, stormy weather, or traffic noises that can appear in musical works. I really like this list of ten lost technologies. How do good ideas get forgotten? Often because they have been kept secret (typical in family-run enterprises or with military technologies, in which secrecy has a commercial or strategic value.) Sometimes, however, good ideas wear out their usefulness and get replaced by alternatives. There has been a great exchange on this process in economic theory among some prominent social science bloggers (here is a good place to start). Among music scholars, ethnomusicologists have long been occupied with the process of theoretical change and the so-called new musicologists took up this theme in the '80s (and now, having become institutionalized itself, the new musicology is increasingly confronted with an offense by a more traditional musicology). Curiously, it is in music theory proper (and its speculative counterpart, composition) that discussion of the patterns of theoretical change seems to be handled at greatest distance. I suspect that this is, at least in part, due to some deep uncertainty about music theory's status as a theory (e.g. a theory of what, precisely?) and not simply description of compositional practice that lies behind this reticence, but I may well be very wrong about this. 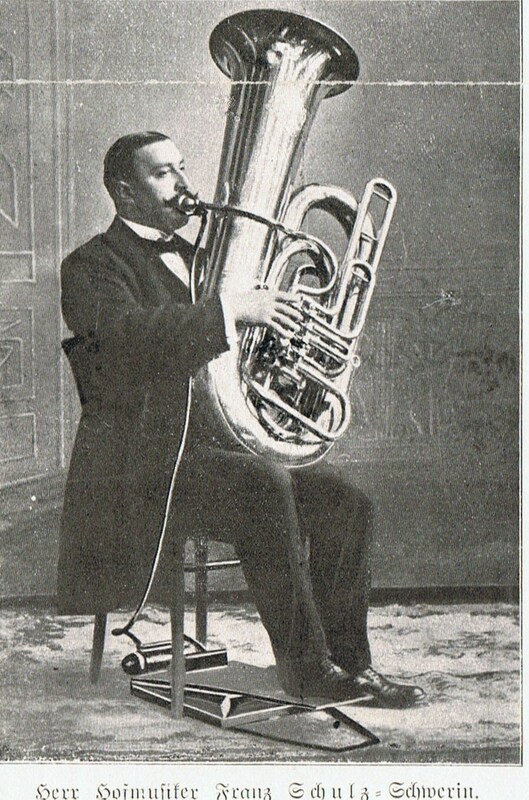 In music, generally, there has been an accretion of ideas and techniques over time, making ever-more resources available to a composer and generally increasing the complexity of music produced. Instrument builders, like those in the Stradivarius workshop mentioned in the article cited above, may keep their trade secrets close, but music itself is essentially "open source", so that musical techniques can usually be decoded and reproduced. This is not, however, universally the case. 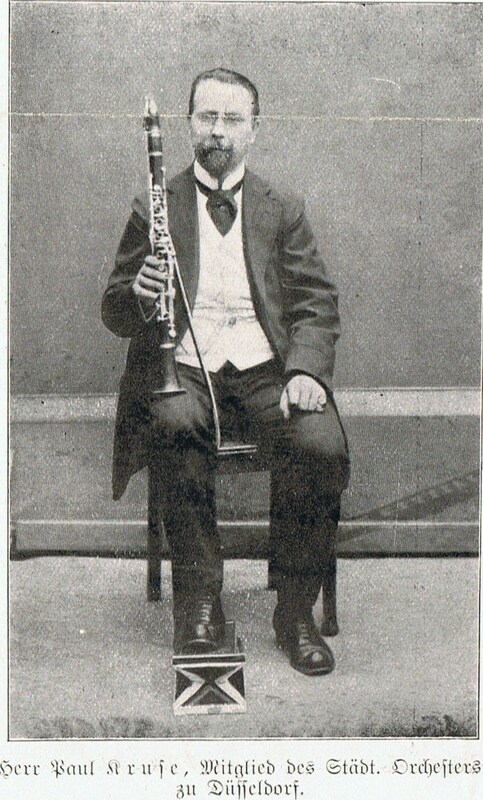 Clarino trumpet playing, for example, largely disappeared after the mid-18th century, and the virtuoso cornett technique disappeared even earlier, with both techniques returning, conjecturally and with mixed effect, in the early music "revival" of the later 20th century. The subtleties of musical change are best demonstrated in the history of musical style. Sometimes, stylistic change goes in the direction of simplifying one or more dimensions of music. Thus, some late fourteenth century music is, in some major parameters, more complex than the music which succeeded it, and similar phenomena can be found at several other junctions in music history. In general, stylistic change is a mixed bag: post-serial musics, for example, may often be computationally less sophisticated than classical serial works, but they can be much richer in historical references and contextual associations. Mahnkopf complains that the discussion in on economic and not purely cultural terms, but we are, inescapably, going to have to talk about economics — at the very least in terms of revenue sources and the allocation of resources; the notion that culture can exist in an economics-free vacuum, I will simply leave alone. Mahnkopf further mistakenly confuses the path of deinstitutionalization with economic neo-liberalization, when what is in question is not a strict privatization of the arts, but rather a diversification of the portfolio in investments in the arts in an attempt to optimize the relationship of the arts to contemporary technologies, resources, and opportunities. So... two composers, a hard-core complexist and an equally hard-core experimentalist, happen to meet in the lumber department of a hardware store, waiting in line to get some plywood cut to order. The experimentalist asks the complexist why he's there. The complexist answers that he's "working on a very big piece, and I'm using so many oversize charts and graphs and tables and arrays" that he needed a piece of plywood so he could add an extension to his desk in order to accommodate all his paperwork. "Why are you here?" asked the complexist in return. The experimentalist smiled: "I like the sound of plywood going through a really big table saw." What bacon is for food, stretching is for electronic music. It can make anything sound better. Here's a prime example, made with Paul's Extreme Sound Stretch. Now that stretching has become so ubiquitous, has it already achieved the status of a cliché? In film music, I suspect that this is already the case. Fortunately, in experimental music, there are no clichés, just resources worth reconsidering. 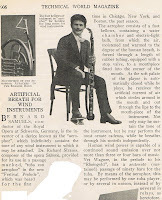 In 2007, I wrote a post here about the Aerophor, a device designed in the early 20th century to assist wind players with sustained passages. 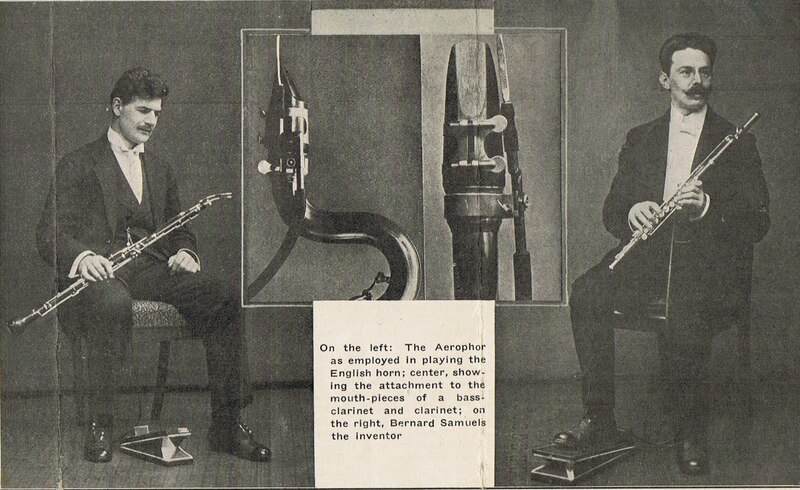 While controlled reservoirs of air have long played a part in creating a sustained tone for certain wind cap and free reed instruments, the foot pedal-operated Aerophor appears to have been a unique machine as it was intended for standard orchestral winds. 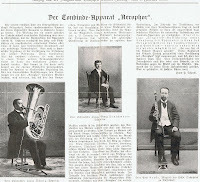 I was able to find little further information about this until, recently, Mr Jacob Polak, of Amsterdam, visited this site and communicated that the inventor of the Aerophor was, in fact, his grandfather, Bernard Samuels, of the Netherlands, for a time conductor at the Royal Opera in Schwerin. (Following other web sources, I had misspelled the inventor's name and misidentified him as Belgian rather than Dutch.) 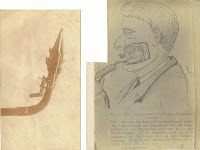 Mr Polak was kind enough to send some fascinating documentation about the Aerophor which he has permitted me to share here (click on individual images below to enlarge.) Based on the description contained in the text the last image below, the Aerophor was a more subtle and sophisticated device than I had previously imagined, consisting not only of a bellows and tube, but a reservoir of water and an electric light bulb, insuring that the air supplied was appropriately warm and damp. 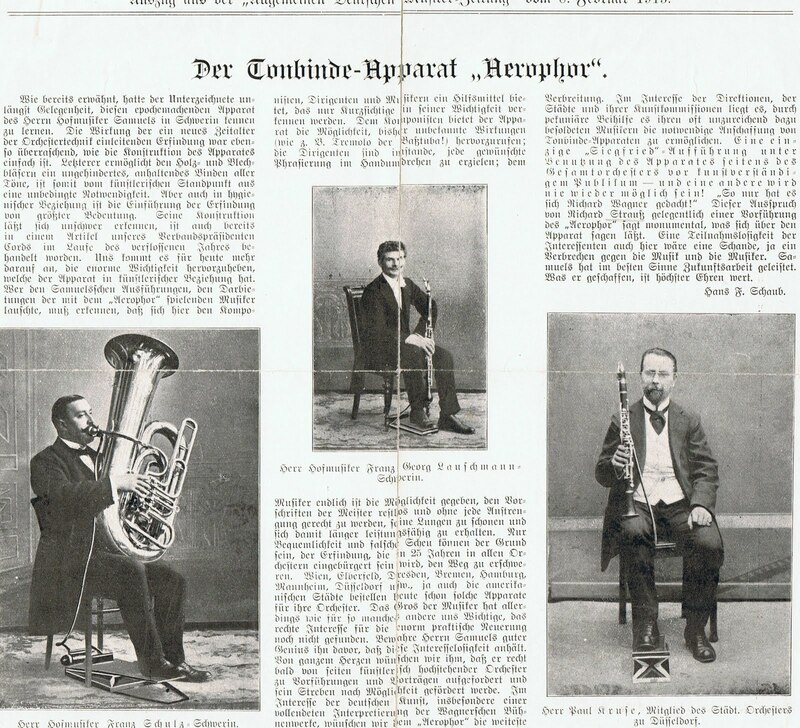 Lacking an actual specimen of the Aerophor, perhaps this documentation will be sufficient encourage a recreation of this useful auxiliary instrument! There has been a thoughtful discussion at Amusicology about the relatively small number of musicology blogs (a number substantially reduced Ithinks by the recent end of Dial "M" for Musicology) . The reasons are, of course, manifold and complex, but I believe that a major reason has been an attitude towards publication which has come to dominate the practice of academic musicology. This attitude focuses on publication directed towards fellow and sister academics rather than to a more general public, and is carried out through the publication forms most likely to be credited in hiring, tenure, and promotion decisions (and — coincidentally or not — the ones you can access only if you have the independent wealth to afford a subscription or have access to a good University library or JSTOR). While there are, indeed, advantages to these publications, the quality filters of peer review among them, and the necessity of some filters given the terrific strain placed on the profession by the limited number of available academic positions must also be recognized, this leads to a general avoidance if not disregard in the profession of forms of publication intended for wider audiences, blogs among them. Two other small observations: The first is that blogs can fill one particular niche in musicological publication that the major journals appear to have largely abandoned: that of the small item, detailing a minor but not unimportant finding. Some years ago, I had a great conversation in Budapest with the late theorist John Clough, in which we bemoaned the fact that academic writing in music had become largely limited to the form of a substantial essay, while many results, insights, and discoveries were smaller than that particular breadbasket. Moreover, with journal publication schedules on perpetual delay, there was little sense of timeliness in publication, and timeliness is certainly an attribute of the excitement of a discovery. Blogs, lists, and other forms of internet publication can certainly fill this void. The second small observation is that with the natural attenuating affect of the tenure process, forms of publication which focus almost exclusively on an audience in the academy are unnecessarily distancing themselves from some of their most astute, best informed, and, potentially, most usefully critical readers. 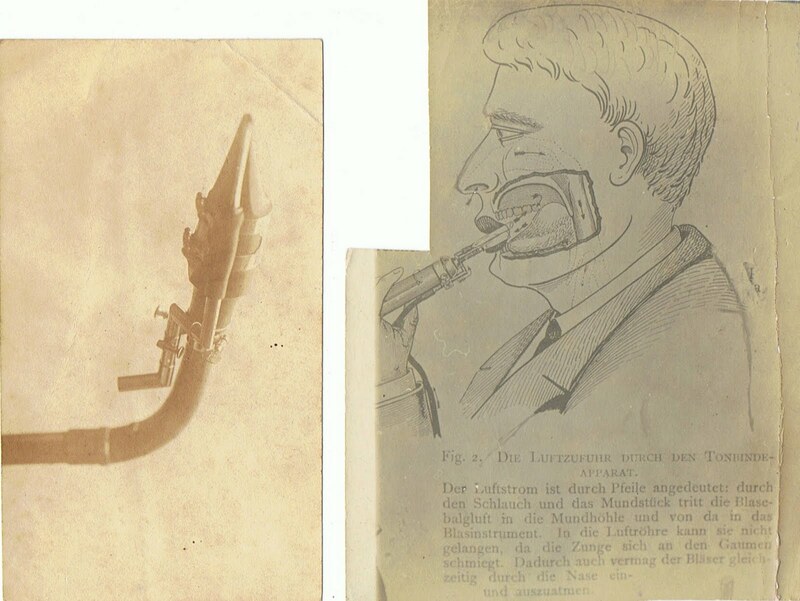 The function of musicology in a University is not only to produce more musicologists but to produce more professional musicologists but to produce a more musicologically-informed body of musicians and audiences. 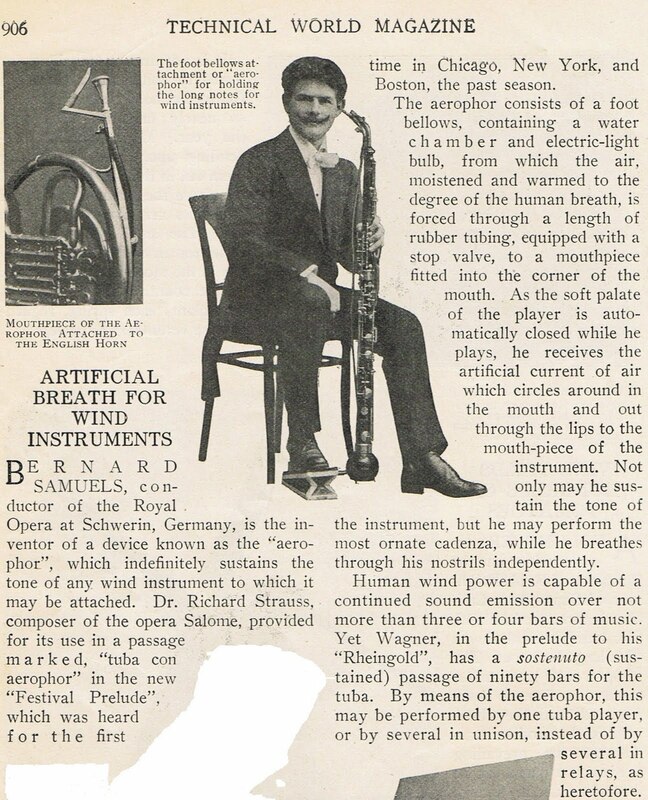 Within this body, the trained-but-amateur musicologist is a noble and undervalued element as well as a natural ally outside of aceme who is disregarded at the peril of the profession, and more essentially, at the peril of the advancement of musicology and music-making in general. Perhaps unique for a 1983 graduate of the University of California at Santa Cruz, all of my experience with drug-induced expansions of perception were vicarious in nature and — to date — I've smoked exactly one cigarette, which had nothing but ordinary commercial-grade tobacco in it*. Nevertheless, I was wildly interested in the possibility of be able to hear more, going so far as to replicate John Cage's famous visit to an anechoic chamber and even spending an essentially Santa Cruz evening floating in the warm salt water of a sensory depravation chamber, but these experiences were enhanced by nothing more chemical than perhaps a room temperature can of Mountain Dew or a chocolate-covered expresso bean, my then-favorite means for pulling study all-nighters. I twice started dissertations about prominent experimental music composers only to get hung up by the fact that I had no idea how to deal with their drug use. The composers in question were active in an era in which drug use among artists was not unusual, and in their personal (one of the two actually spent some time in jail on a drug bust; the other I never met when he did not appear to be tripping) and, especially, musical biographies, drug use was so central that the fact that I had no personal handle on the topic seemed to unduly limit my work. In the end, this was a major reason among several for dropping each project. Alex Ross has a pair of posts (here and here) about a harmonic progression with some significant history, moving, for example, from F# Major to d minor, two chords with no common tones. As it happens — the lattice of coincidence being what it is —, in Budapest last week, I picked up a copy of Ernő Lendvai's Verdi and Wagner, a volume intended to be the first of several on "Bartók and the 19th century". 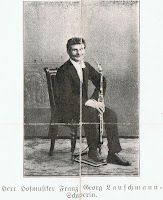 Lendvai is best known to musicians for his thesis that major structural divisions in Bartók's music correspond to Fibbonaci proportions and the golden section. I've never been convinced that this thesis is precisely true, but find it unremarkable that such proportions in a rough form are present as it simply makes sense that major events in the course of a musical work would be successfully programmed to maximize our attention by appearing somewhere between the half-way point and the end, and a sequence like 1:2, 2:3, 3:5, 5:8, 8:13, ... hovers right in that region. * I suspect that a great deal of hovering around these ratios has been and will be tolerated in the exact divisions of a single musical work, so much so that an over-obsession with precision is probably unneccessary; moreover, in Lendvai's own accounting of Bartók's actual proportions, there is enough variability — particularly due to tempi — that considerable fuzziness in the ratios of real elapsed time are inevitable. This series of books, however, was intended to focus on Bartók's relationship to a harmonic tradition, in particular that of the major later 19th century opera composers, Verdi and Wagner. (It's worth adding here that the two more immediate influences on the younger Bartók's practice were Richard Strauss and Franz Liszt, who could be considered as mediator's between Bartók and those operatic styles.) I bought the book with nothing more in mind than having some streetcar riding material, but it did turn out to be fascinating reading, although in ways Lendvai certainly did not intend. What Lendvai did intend was to describe later 19th century harmonic practice in terms of the interraction between the diatonic and the chromatic, the one irregularly, assymmetricly, divided, the other evenly and symmetrical. So far, so good. But Lendvai's treatment rapidly goes beyond this, constructing an elaborate system with idiosyncratic terminology and then going well beyond his system proper by associating literal "meanings" for particular harmonic relationships with excourses into topics like key characteristics. The bulk of the volume is given over to a description of Verdi's Falstaff. As far as I'm concerned, music theory of this sort is close to snake oil, with its effectiveness as analysis approximating a placebo effect more than a real account of what our ears and brains do with musical sounds. That said, the fact that real musicians have taken and do take such constructions seriously, as an impetus to the production of real — and often very fine — music, means that it is a real part of the culture around the music and, at the very least, we have an ethnographic obligation to take it seriously as well, at the very least as a locally coventional — if, ultimately, in terms of the psychoacouctical and neurological foundations of musical perception, arbitrary — means of giving constraint and order to musical materials. 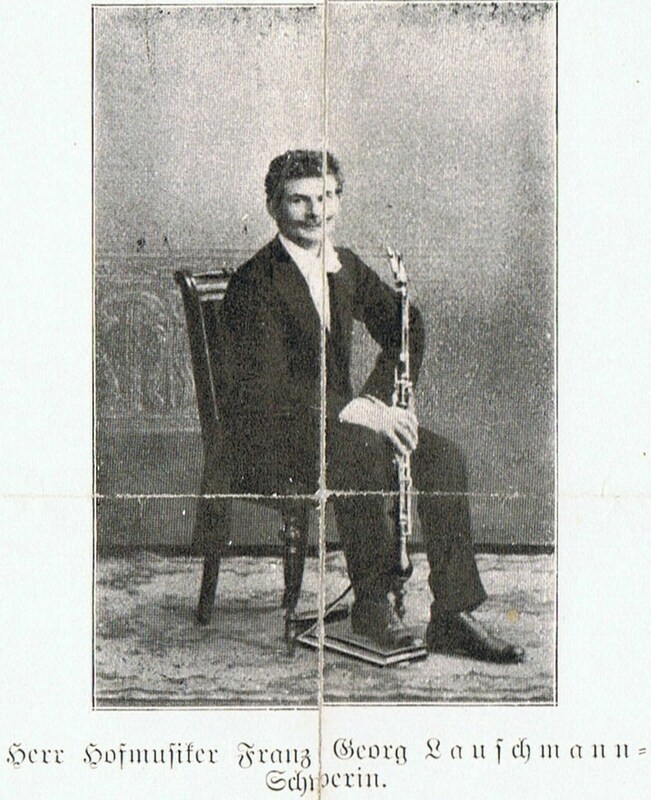 Lendvai's "theory" is, ultimately, a doctrine, positing for the late 19th century an extension and equivalent to the earlier doctrines of musical figures and affects. Now, the chord progression which Ross has noted might be described in terms of any number of theoretical "systems" — Lendvai's among them — and individual composers may well work productively with such systems, and it has certainly established itself in the repertoire as a recognizeable figure with an associated affect, but there is probably no real need to call up either an elaborate theoretical apparatus or an existing repertoire of usage to identify the salient qualities of the progression: the two chords are connected by a smooth ("parsimonious" is the term of art) voice leading,** yet — depending upon how one deals with "enharmonically equivalent" tones — do not come from a common diatonic collection. Most tonal music bops along within the same diatonic collection, venturing from time to time to collections that share most tones, so a sudden jump like this one plays with our habits and expectations. The effect — and possibly, affect — is thus both smooth and startling. * When one traces the development of the Sonata form, one finds a similar refinement of proportions, successively moving the point of furthest harmonic remove from the center of the simple AABB Sonata further back into a development section. ** It is not a coincidence that the examples here are taken from vocal ensemble and opera, in which changes of texture, i.e. not maintaining a constant four-voice ensemble, are frequent.